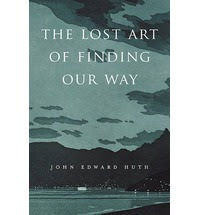 I read a review of John Edward Huth's The Lost Art of Finding Our Way in the Washington Post and could not resist buying the book. It is, ostensibly, a history of navigating and an explanation of various navigation methods. Anyone who has been besotted by a map and compass or a GPS unit will know how reassuring it is to know 1) where you are, 2) where you are going and 3) how to get back home. Dr. Huth makes all of this real, giving you a whiff of what it was like to nail up new trade routes using much older forms of navigation. And it is fascinating. But what struck me was how far beyond navigation Dr. Huth moves. On the opening page, he describes a typical commuter today, one who "talks into the air... while playing with a tiny box he holds in front of his face." And he nails all of those sad sacks: "You hide the box, and he becomes helpless." He goes on to compare and contrast a fisherman three thousand years ago and how he would be able to answer basic questions about navigation, weather, and other things. The hook is the last sentence on the first page: "Whom would you consider the more primitive of the two: the commuter or the fisherman? As information technology has grown, our ability to perceive and think independently without help from devices may be compromised to the point where we, not our forebears, are the primitive ones." And have written about my hope for The Literary Mind. I bought Dr. Huth's book and left it in the shipping package, trying to save it for travels this summer, but found I couldn't leave it alone. I look forward to seeing where he takes me.